So Many Choices! What To Pick? Perhaps you have been in a few flooring stores and became overwhelmed by the choices. Listed below are some of the most sought after answers. Often times you will get different answers from different places. 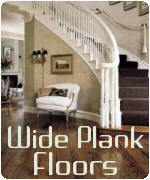 • What's the most durable hardwood floor? • I have oak honey cabinets...what's the best color?" • We live near the beach...sand? Engineered hardwoods by far are chosen more often in Florida for several reasons. For a better understanding of the differences between engineered and solid, advantages and disadvantages, we've put together one page devoted to the subject here. What's the most durable hardwood floor? This is a very hot topic, and depending on who you talk to a variety of opinions will be heard. We suggest reading our article do I really need a hard, hardwood floor before selecting any hardwood floor. I have oak honey cabinets...what's the best color"
Color choice is more of a personal preference than anything. What may look good in one home may not in another. Today people are mixing up different hardwood species from cabinets to flooring. One item seems to be prevalent when it comes to baseboard and/or other trim. White or off white seems to be a steady trend in South Florida, as lighter colored paint selections are the norm. They have some great ideas, but experimentation seems to be the norm. Case in point, a spec house built in 2002 where five different types of hardwood floors were installed. And the painting choices were unbelievably strange. Nothing looked consistent. In one room a beautiful herringbone floor was chosen and another, a plain looking engineered floor. The engineered floor butted up next to another beautiful wide plank floor. To make matters stranger, in one portion of the house the master bedroom had a gorgeous marble floor. Instead of flowing through the areas, engineered flooring was again chosen... for the closets! Upstairs was a circular mezzanine done in solid 3/4" hardwood. In one bedroom that connected, another engineered floor was chosen with a completely different look! Frankly, our opinion is consumers have a better grasp on color and design decisions than most decorators. When it comes to color choice, look at it this way; you'll have to live with it and we cannot make that choice for you. You can pick up some great ideas from magazines and the like. We live near the beach...sand? Sand will always be a factor, and can easily scratch any hardwood floor. By taking care of your hardwood floors with a few important preventative tips they should last for years.